This challenging backyard had a 15 foot change in grade and a rough boulder wall before I started this project. I designed and installed a series of stone retaining walls and natural stone slabbed steps leading down from a new deck and upper patio. The lower stone pool patio featured in this photo is a mortared to a concrete slab. An outdoor kitchen can be seen on a mid level patio to the right. A sound system and lighting system surrounds the stone work and is hidden in the plantings. 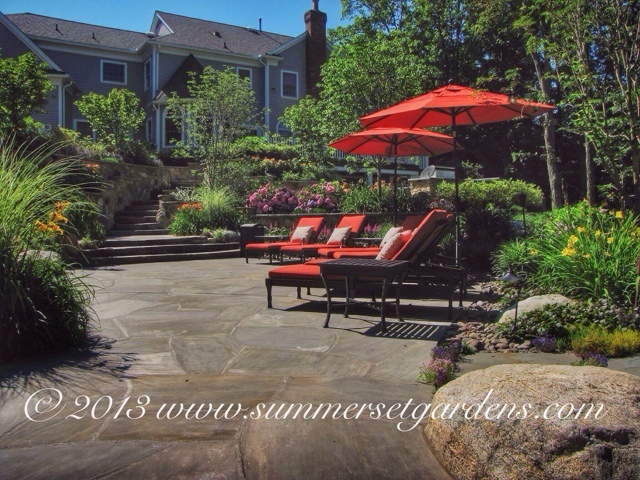 Landscape architecture, masonry and construction services in the NJ and NY areas.